What Is Sound & Vibrational Therapy? There are many forms of Sound & Vibrational Therapy, sometimes referred to as “Sound Therapy”, “Sound Healing”, “Sound Bath”, or “Sound Massage”. Some forms focus on toning & vibrating the physical body--the cells, muscles, organs, and bones. Other forms focus more on the energetic field of the body--chakras, meridians, acupuncture points, or the auric field around the body. 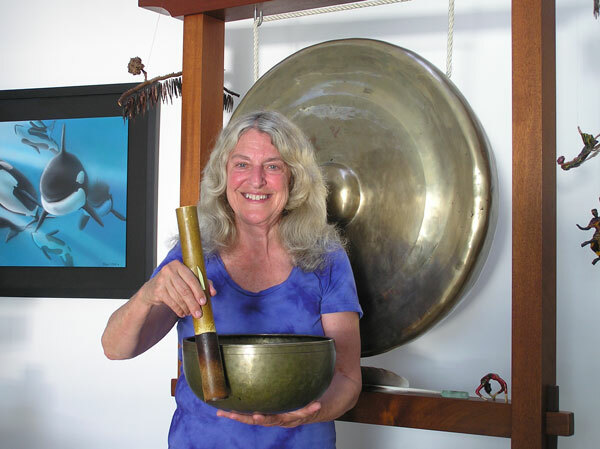 Barb’s Sound Massage accesses multiple forms of Sound Therapy, naturally affecting all aspects of our being at once--physical, mental, emotional, and spiritual body levels. The concept behind Sound Therapy is that our whole being, our every cell, is part of a symphony of sound. When everything is vibrating and “singing” in harmony, we’re in vibrant, good health. When some part of us falls out of harmony with the rest, we find disharmony, discomfort, and possible illness present. By introducing and magnifying harmonic tones and vibrations, the different levels of the body naturally entrain to these harmony frequencies, allowing the body to come back into balance and good health, easily and effortlessly. Our body’s intelligence is always seeking balance. As we let go, and ride on the mesmerizing sound waves, the body can do what it needs to do to come back into harmony and balance, emanating a beautiful Symphony of Sound.